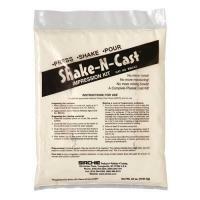 Create precision castings with speed and ease using the Shake-N-Cast Impression Kit from Sirchie. The self-contained kit eliminates all measuring and room for error when it comes to creating the perfect casting solution consistency to retain every detail of an impression. The package contains a pre-measured, breakable water capsule and gypsum-based casting powder to deliver the perfect formula every time. No more inconsistent molds, incorrectly estimated ratios or messy mixing material--simply crack the inner capsule, shake and then pour. Each package contains mixture to make an accurate mold of one adult shoe print.